1950-1959 - a period devoted to choral and balladic creative work, to the leadership of the Institute for Music at the Bulgarian Academy of Sciences, to dynamic action in the field of the amateur musical-arts activities, to energetic participation in the activities of the Union of Bulgarian Composers. 1950 - appointed Director of the Institute of Music at the Bulgarian Academy of Sciences ( a position he holds until his death). 1950 - writes: the ballad “They have fought for three days”, for a male choir, lyrics by Dim. Bozakov; “A youth’s song” (unpublished); “A pioneers’ salute to Stalin”, for three voices, lyrics by Elisaveta Bagryana. 1950 - on Apr. 30, awarded the “Honored Artist” title, for his long years of creative activities in the field of musical arts. 1950 - the General Assembly of the Bulgarian Academy of Sciences appoints him as an academician - secretary responsible for the division of fine arts and culture (until 1960). 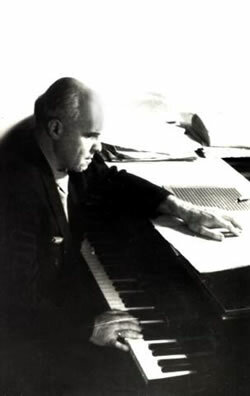 1950 - on May 13, is bestowed Dimitrov’s Award, I-degree, for the works “Thracian dances”, “Thrace”, “Symphonic scherzo”, two symphonies, and choral songs. 1952 - elected a member of the Presidium of the Union of Composers, Musicologists and Concertizing Artists (later Union of Bulgarian Composers). 1952 - on April 29, awarded the title “People’s Artist”. 1952 - elected by the General Assembly of the Bulgarian Academy of Sciences as a member of the Editorial Publishing Council of the Academy. 1952 - at a general assembly of the Union of Bulgarian Composers, is elected as a member of the Editorial College of the “Bulgarian Music” journal. 1953 - writes “Youth overture”. The premiere takes place on April 1, performed by the State Radio-Orchestra with Vasil Stefanov, conductor. 1953 - writes the songs: “March refrains”, for two voices, lyrics by N. Marangozov; “A song to the golden fields”, for a mixed choir, lyrics by Ml. Isaev; “A folk song”, for two voices, lyrics by K. Zidarov; “A song to the forest workers”, for a mixed choir, lyrics by D. Panteleev; and a “Song to Stalin”, for a mixed choir, lyrics by N. Vulchev. 1953 - by a resolution of the Council of Ministers is selected as a member of the International Jury of the IV World Youth Festival in Bucharest. 1954 - writes the ballad “Comrade Anton”, for a mixed choir, lyrics by Iv. Radoev. 1955 - writes the ballads: Best-man German”, for a mixed choir, lyrics by Dim. Panteleev; “A sailors’ ballad”, for a male choir, lyrics by D. Bozakov; and the song “Patriots”, for a mixed choir, lyrics by D. Bozakov. 1955 - by a resolution of the Council of Ministers is selected as a member of the International Jury of the V World Youth Festival in Warsaw. 1956 - the 60-th anniversary of the composer is celebrated officially; he is awarded the People’s Republic of Bulgaria Order, I degree. 1957 - by a resolution of the Council of Ministers is selected as a member of the International Jury of the VI World Youth Festival in Moscow. 1957 - writes the song “Oh, Motherland”, for a mixed choir, lyrics by St. Poptonev. 1957 - the monograph “Petko Stainov”, written by Venelin Krustev, is published. 1957 - on Dec. 12, is elected people’s representative in the Third People’s Assembly (Parliament). 1958 - writes the two-voice songs “Brook”, lyrics by Kalina Malina, “My home village” and “A night in the mountain”, lyrics by Iv. Davidkov. 1959 - in his quality of a member of the Presidium of the Union of Bulgarian Composers, represents the Union at the Festival of the Bulgarian chamber and symphonic music in Plovdiv.